Remington Over/Under Rusty Relic Dup Up Derringer. Rusted pitted old derringer relic. Not loaded. Gun is frozen, no moving parts rendering it non-functioning, therefore it does not work. Nice historic find. 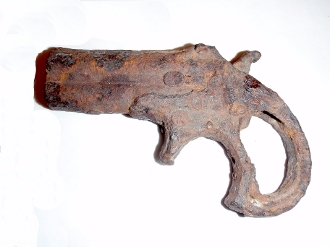 Typical of concealable weapon carried by wild west gunfighters and riverboat gamblers. Appears to have been buried for a long time and wood grips have rotted away. Unknown location of find. No doubt a lucky find. There are no makers markings or serial number that is readable. I have no other information. This was a popular gun of its time easily concealed in the vest pocket or inside coat pocket. Typical of concealable weapon carried by wild west gunfighters and riverboat gamblers. Great relic display gun.